GOLD – no relation to the Roger Moore adventure vehicle of the same title from 1974, or even the borderline-science-fiction German epic of 1934 (whose climax of titanic explosions got re-used as stock footage by numerous Hollywood B-movies) - made its premiere late in 2016, apparently with the faint hope the Bob/Harv Weinstein production would be deemed Oscar worthy. But it earned no nominations for that kind of gold whatsoever (funny, the Roger Moore GOLD did get an Oscar nod for the Elmer Bernstein/Don Black music; check out the forgotten score online), and the feature directed by Stephen Gaghan, rather quietly made its way into most theaters in early 2017. I caught it on a pure whim and was rather surprised how much I liked it. Even with a Matthew McConaughey star-turn heavy on the scenery-chewing, it still felt like a picture actually made for grownups, a little bit more than most. Then again, so would the Roger Moore or the German one, in these lamentable times. The plot is said to “inspired by true events” – yeah, that old carny come-on – one is surprised that ROGUE ONE didn’t make the same boast - but I do believe GOLD derives from an actual case that involved a Canadian company. McConaughey, laying on the McConaugheyisms really thick to match a paunchy waistline, plays Kenny Wells, hucksterish businessman carrying on his father’s Reno-based mineral-prospecting company, that has never made it out of the boiler-room leagues. In fact, by the 1980s the company is almost nonexistent, running principally out of a Nevada bar and the home of Wells’ long-suffering waitress-lover (a marginalized Bryce Dallas Howard). On a longshot, Wells gambles his last remaining liquid assets and investor money behind Michael Acosta (Edgar Ramirez), a maverick geologist with an idea that he can locate a vast gold deposit in Indonesia via plate-tectonics theories (the science is given pretty short shrift in the script, I noticed; never know when school boards will ban continental drift as heretical – Ohio will be among the first, I think). The two go to an obscure jungle valley in Indonesia and to prospect fruitlessly, until, at the last minute, Acosta comes up with a rich rock-core sample that promises not just a lucrative gold strike but one of the biggest of all time. Suddenly all the Wall Street fat cats and financiers who ignored Kenny Wells come courting him – and then trying to prey on the seemingly unsophisticated and uncouth Wells, a cowboy-type entrepreneur, who still does contracts by handshakes and writing on napkins. The script becomes something in the genre of WOLF OF WALL STREET and THE BIG SHORT in depicting the corrosive effects of greed and ego on a flamboyant, flawed hero. Midway through, we realize that what started out as the lead character’s folksy narration is actually recorded testimony, and something really bad must have gone down in Wells’ volcanic rise. It’s so obvious, in fact, that with all the chicanery and manipulation going on by business crooks on all sides that you just might actually be caught by surprise. 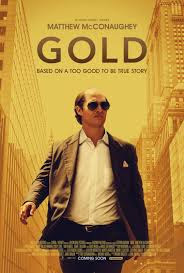 There’s kind of a nice balance in McConaughey’s extravagant mannerisms and Ramirez’ low-key partner role, but perhaps what really makes GOLD interesting (or, conceivably, for some viewers, uninteresting) is the de-mystification of the modern wildcat gold-prospecting business. Gold hunting is the background/ancillary detail in countless western shoot-em-ups and crime programmers, but who knows how gold speculation actually works in a business sense? Stephen Gaghan’s feature, gilded as it may be with Hollywood iron pyrite, shows us a little of that, yet still pleads for the allure of the rare mineral and the lengths people will go to be associated with it.